Turned and blackened steel buffer heads as supplied in MJT sprung buffers which are listed elsewhere. 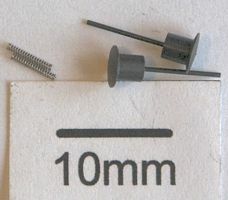 These buffer heads have stepped shanks 2.5mm to 0.4mm and are supplied with suitable 0.9mm diameter springs. Pack of 20.